My name’s Lauren, and I am an accountant/painter/gamer/adrenaline junkie/nerd/everything enthusiast. As a kid, I enjoyed doing anything related to painting, interior-decorating, or art in general. I stumbled upon the SNES in 1st grade, and since then, I’ve grown a strong passion not just for video games, but the imagination and effort that the creators of games must have to create one. From the graphics to the mechanics, and especially the score/sound effects (Jeromy Soule and Lorne Balfe are the greatest composers ever) video games have been one of the main driving forces behind my art projects. I think it’s important to celebrate the talent that goes behind the creation of video games as much as we celebrate and admire sports players, musicians, or movie directors. Video games are just another outlet for people to express what they enjoy doing in life. But there’s more to my life than my passion for video games! I can definitely play a game for 12 hours straight when I want to, but I have an equally huge passion for traveling and experiencing the outdoors, and getting my adrenaline kick in when I can! Probably the best description for me is a “Jack-of-all-hobbies.” I really haven’t found a hobby I didn’t like! The way you love that, and the way that you find other people who love it too is what makes being a nerd awesome. And don’t ever let anyone tell you that the thing that you love is a thing you can’t love. Don’t ever let anyone tell you that you can’t love that because “that’s for boys,” that you have to love this, cause you’re a girl. …or the more adventurous side (yes, that is me attached to the bungy)! I came from Reddit! This is pretty awesome. I’d like to do gaming themed rooms for my kids but I’m in a rental and we aren’t even supposed to paint. One day tho! My dear, if only you were a few years older. 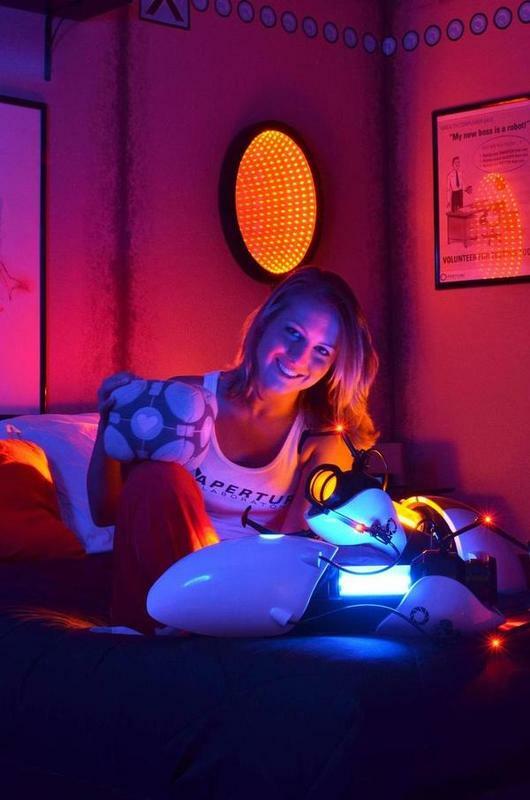 I’m not interested in video games but now I’m thinking….why not create room themes based on other interests? Like music or philosophy or Tintin? I’ll have to give this some thought. Thanks for putting some new ideas into my head. “Dear Everyone, This person exists.” Awesome! Please continue. Extremely cool! Hmmm, I’ve got a whole four bedroomed house that needs redecorating. Too much? A kindred soul! Seems we are a lot alike., only where it says accounting, put chemistry/physics… that’s my jorb. Carry on with your awesome self! Insanely great, even without dalek. Very well done, Lauren – quite a work of art! Kudos!